You know that exit popups work. You know their benefits and the different types of exit popups you could use. You also know the structure of a perfect exit popup, and the importance of its headline. But when it comes to creating one… you blank out, right? You have no idea what words you should use to stop a visitor from leaving your site. And so, I decided to help. 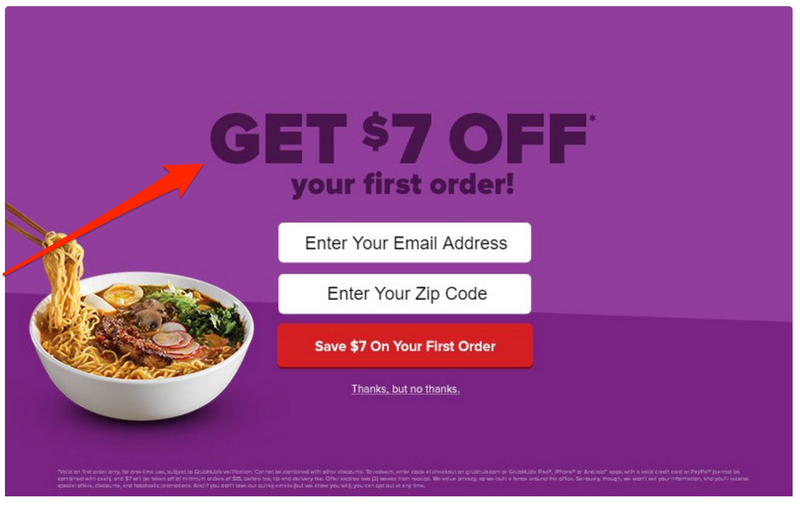 In this post, I’ll show you 7 ready-made exit popup headlines you could start using right away. And then, I’ll also explain to you why they work and when you should use them. Sometimes the best way to stop someone in their tracks is by being firm and telling them exactly what to do. Not all visitors who already decided to exit the site will be swayed by an offer, numbers or other copywriting tricks. But they will all pay attention to a command. It’s in our human nature. We hear commands, instructions, and orders every day. And although we don’t always act on them, we always pay attention. Copywriters refer to headlines targeting this behavior as Command Headlines. They aim to tell a visitor exactly what to do, without beating around the bush, using word plays or being witty. Instead, they use a strong action verb to command a reader. In other words, these headlines hit a person right in between the eyes and direct their next actions. Grab this free course now! However, given the goal of using exit popups, to prevent someone from leaving the site, focus on doing exactly that, stopping them. We’re suckers for a good offer. According to one research, for instance, many customers would have no problem abandoning a brand they’ve been loyal to for years if a competitor presents them with a better offer. We also see nothing wrong in availing of discounts on websites. According to Smart Insights, 41% of customers believe that coupon codes are socially acceptable. And, according to the same source, 4 in 5 UK adults have used a discount code last year. Finally, 23% of customers get discount codes from the company’s website, rather than discount sites. And so, it goes without saying, right? Discounts work. This type of headline is called a Direct Headline. It states the offer or value proposition clearly, with no hidden meanings or puns. Direct offer. Direct headlines work because they don’t force the audience to analyze and decipher their value. Instead, they present it in as straightforward way as possible. It will work only on a very specific type of visitors, people who exhibit what researchers call, a promotion focus. Customers with a promotion focus are eager to achieve something. And they’re not afraid to take action to get it. Using the verb GET suggests an action that will lead to a reward, something promotion focused customers will naturally prefer. This is a variation of the previous headline, using the same principle of offer and numbers. However, it targets a different type of customers. This headline aims to attract people with a trait of behavior known as prevention focus. Unlike those with promotion focus, prevention-focused customers don’t want to take any action to gain something. They want to achieve it by vigilance. The headline offers the same benefit as the example above. However, the verb SAVE communicates that instead of taking action to gain a reward, they’ll do it by avoiding higher costs later. In other words, buying now will result in paying a lower price. This time, however, instead of focusing only on the action verb, this headline includes the entire call to action. Many companies would use the “Grab the Free eBook” section as the actual call to action button in hope that the action-oriented copy would entice more visitors to click. And this approach works exceptionally well. However, you could also use it in the headline, strengthening the effect it has on stopping visitors as they’re about to leave the site. Fear of missing out. FOMO. I’m sure you’ve heard those terms before. But did you know that they act as powerful drivers of our behavior? Targeting this behavior could also help you convert more visitors into subscribers or customers. And that’s what this headline could help you achieve. Simply tell a person what they could miss by not availing of your offer to attract their attention, arouse curiosity, and convince to act. In fact, countless experiments proved that we often assume the behavior of others to be correct and emulate it. And that’s even if we subconsciously know that what they’re doing is wrong. Just take a look at various studies I presented in this guide to social proof marketing. You’ll be amazed. But back to exit popups. One way to catch a person’s attention and convince them to do your bidding is to present them with proof that others have already done it and benefitted from it. And that’s what this headline is all about. Highlighting something’s popularity to work as a proof of its quality. And you can use it in a popup to convince leaving visitors that they might be making a mistake. Finally, use a question to grab a person’s attention, and arouse their curiosity. You see, we’re naturally wired to spot questions. No matter how focused a person might be on leaving the site, the moment their brain notices a question, they will immediately start paying attention. Guaranteed. Now, whether they’ll act on your offer is another story. But that question will certainly help you get the conversation going. What do you make of those exit popups headlines? Will you be trying them out in your business? Tell us in the comments.